Liz Briones is a multi-dimensional vocalist and one of maryland's best kept secrets. 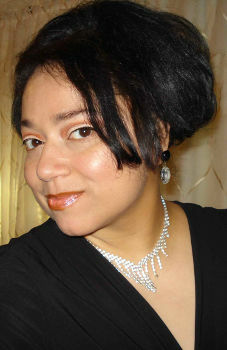 Liz has been captivating her audience for years with her own soulful blends of jazz, blues & r&b. This diva's charming combination of talent and charisma has taken her from South America to South East Asia with notable performances at major five and six star venues. While still enjoying the fruits of her labor with the release of her self titled jazz standards cd as well as the buzz she has created around town from different festivals she has participated in and clubs she currently works in, Liz is not resting on her laurels, she is hard at work preparing for her sophomore release. Her performances are a true interaction between herself and her trio who fit with her like hand in glove. Her trio consists of some of the best musicians in the area. They seem to know each others musical moves instinctively. Liz's ability to take a song and make it her own gives her a fresh sound that appeals to a wide audience. Whether it's jazz, blues, r&b, Latin or Brazilian, you won't think she sounds like anyone else you've heard. "Follow your bliss and doors will open where there were no doors before" is her mantra, and doors have been opening ever since for this ambitious diva. You won't want to miss a note!